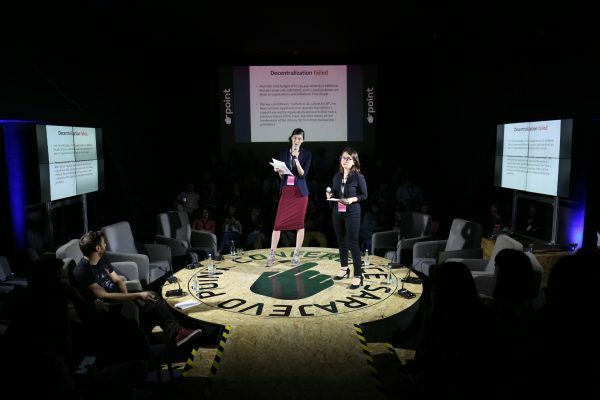 Second part of regional presentations on POINT 7.0 conference offer us three presentations from Macedonia, Albania and Bosnia. “From the total budget of 10.739.446 denars (no additional 860.462 denars are estimated), 5.354.694 denars are given to organizations and individuals from Skopje. The key commitment, “Culture to all, culture for all”, has been omitted. Applicants who received the ministry’s support are mostly organizations and events that have a previous history of the event, but not a history of real involvement of the citizens”, Marija said. Besjana Hysa and Viola Civici from the Albanian Institute of Science presented how open data can show us irregularities in public procurement and show us few examples from Albania. “Santa Quaranta Hotel, owned by Balili-Ko was confiscated following suspicions of this hotel being a “product of criminal offences.” Greek and Albanian media have reported that the hotel was, allegedly, used to make illegal video recordings of intimate moments of high-level Albanian officials, which are reportedly used to blackmail them in order to get favors in terms of public bids and privatizations. The person under international arrest warrant is known for his connections with high-level politicians”, Besjana said. Adnan Pripoljac from Bosnia presented fellowship program of SHL which gathered many young people from Bosnia in Young Leaders program. The title of his presentation was “How to create agents of change in Bosnian context.